Dave's unique Big Band style of standards and inspirational music has spanned over five decades, and he continues to perform several concerts each year. Dave often sings with Big Bands across the country, and he has performed with bands conducted by famous composer Ralph Carmichael. In fact, Dave and Ralph have recorded a few albums together. Dave has also performed for three Presidents at the White House, and for many conferences and conventions. 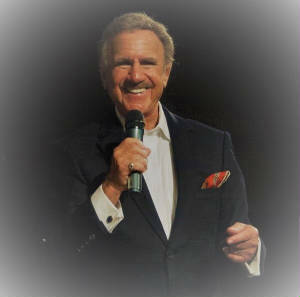 His timeless music and message, coupled with his strong vocal performance, still bring Dave several invitations each year, all across the U.S. With a new CD released in 2016, Dave has found new energy and desire to perform the great love songs and gospel favorites on the album; "In His Time." 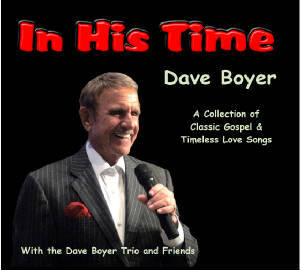 Thank you for visiting the official web site of Christian recording artist Dave Boyer. Click the page links to find information on how you can book Dave to sing at your church or upcoming event, the Biography page where you can read how God turned his life around, order his CD's and videos by following the link to the product page, and watch videos from past performances. Only $15 plus postage. Click the "Add to Cart" button then select the quantity you would like to order. Song list: All the Way, Cheek to Cheek, Have I Told You Lately, Night & Day, Embraceable You, My Romance, When I Fall In Love, Since Jesus Came Into My Heart, He Looked Beyond My Fault, Get Happy, Guess Who's Coming to Dinner, Wherever He Leads, Room At the Cross.